Medical leave or the sick leave is an added advantage for the employees regarding their health and safety paucity. When the employee is in severe pain or in frustration due to unexpected mood swings or even due to shocks they will be in need of leave. So in this situation, employee can apply for medical leave where the employee can take care of their health without losing his/her salary. The employee must have worked for the organization at least for a period of 12 months. This can be applied when the employee is under medical care or should have stayed in the hospital. If it is a family member, then the person should be in hospital atleast for 3 consecutive days. In the case of chronic diseases, the organization will be chargeable for two master checkups. In the case of pregnancies, employees medical records and the number of checkups and even the delivery has to be paid by the organization. Providing as much as notices before 30 days of relieving the work will help in planning the work and projects handled by the employee must be surrendered to another colleague. This method will not affect the normal routine. If an emergency situation arises that, there are no plans about the medical leave such as unpredictable circumstances etc, then the employer will manage all the other work. While meeting the human resource representative, the employee must clarify the leave request and also about FMLA, which will help in specific plans for the leave. Human resource team will help in identifying the information given by the employer whether the employee has leaves or not. Medical certificates have to be provided in case if the employer requests for. The leave will be generated based on the certificate and also by furnishing those details an individual will be aware of health care provided. These complete certifications can be done with the help of a representative from human resource team. If the employee has worked for atleast 3 months with the employer then the medical fees, consultation fees will be paid by the company as per the medical reimbursement plan. Here the employers will decide whether it can be produced from the company. Knowing the position and rights in the organization is more important while applying for medical leave. As this cannot be done every day, it is more important while making a request. Each and every organization follows FMLA that can be abbreviated as Family and Medical Leave Act. This act can be utilized if the employee cannot work properly due to severe illness or when the blood relative has fallen sick. 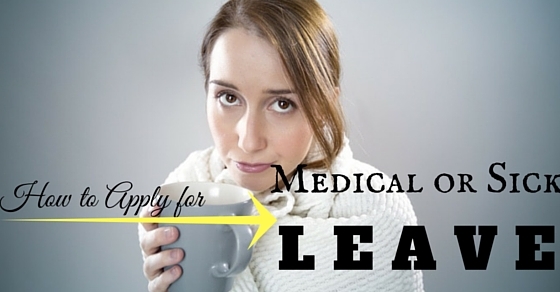 Here are steps mentioned to apply for medical leave. The employee should submit a formal letter that should be considered as a request to the employer. Before producing it, one should be aware of all the rules and policies of FMLA, so that the medical expenses will be covered under this act. “I have written this letter to request you for the approval of my intermittent medical leave as a result of (diagnosed disorder). Since this requires extended leave due to my absence. As my physician has provided a medical certificate, I have enclosed it. Before apply for medical leave it is advisable to consult regarding the leave policies with the human resource department. So that they will guide as per the rules and policies and even the number of days applicable etc which will help in proceeding further for applying leave. The employee should not assume that the leave request will be approved as soon as it is submitted. The person has to check with a request as per the procedure whether it is approved or not. This reason and the protected leave will be an obstacle for loss of pay. “With utmost respect, I am writing a formal sick leave request email to manager of absence as I have a serious health issue that bothers my day to day activities. Because of this, I am unable to come to office as I have to undergo regular checkup and medication. This leave is a job-protected leave which means the leave is subjected to the law. This leave can be taken under any unforeseen circumstances. This will also comply with all the legal requirements. It’s a change and period of the job from full time to part time or can be a change in the number of working hours. The employer must grant leave by qualifying exigencies. This will help them in utilizing the detailed customary approaches. It is generally practicable and unforeseeable in advance. This will disrespect the given notice as per the regulations that will not disrupt the employer’s operations. “I am writing this letter as a formal request with utmost respect. As I am suffering from a particular disease (mention the disease) and so I would like to be under the surveillance of doctor. Furthermore, extra duties will be accomplished by me after returning. This leave will be provided in case of family crisis as per the limited right and work to the employee. It is entitled to any of the close family members. It owes to indispensable injuries and illness that the family member of the employee undergoes. They can be a child, life partner, parent or siblings. The maximum number of days provided is 3 days in 12 month period and it can be paid Majeure leave. As per the parental care, the employee can care about defined and forceful act upon Majeure leave. This online issue is referred as the dispute that occurs. It modulates the complaints that are brought within a normal time limit. “I am writing this letter to inform you that my (relative) has met with an accident so I am on leave for a couple of days. Talking to the human resource representative who is in charge of payroll processing and attendance is much more important because they will guide the employee about proceeding with the further process. The fact is that patients who are recovered from cancer has to follow up for regular checkups and must undergo physical exams. This process will include endoscopy, imaging etc. The recurrence of cancer has to be checked often and also can be identified by a change in health. This purpose will check for the prevention and detection of other symptoms. Side effects and the complications have to be identified as the employee in the organization can help accordingly. This contact will help in support and nutritional supplements as this will not affect the emotional support. “With due to the respect, I would like to express that I had lung cancer before two years. I was advised by my doctor to visit him until the treatment gets over. Since the treatment date is followed up I want to visit the doctor after two weeks. So I have returned to my native earlier to collect my previous reports and histories and the related medicines. Each organization provides leave for pregnancy for a reasonable period. This leave can opt even in case an of childbirth and the other related conditions. This period does not exceed more than four months. Each and every married woman has certain rights in which pregnancy disability leave is one among it. This denotes that the woman is unhealthy and wanted to take rest as per doctor’s suggestion. “I am writing this letter to bring to your acknowledgment that I want to utilize my pregnancy leave as my baby’s due is on (date). It is advised that I should be under the supervision of a doctor as early as possible. I would also like to add one more point to it telling that my annual leave is also full so I will cover my pregnancy leave under this allowance. The reason to apply for a medical leave should be a valid reason as per the company rules and policies. These medical leaves are as certain that are uncertain and also unpredictable. Here either the paid leave or vacation leave can be added, if the employee runs out of his/her medical leaves. The employee has to inform the manager as early as possible where he/she should inform the human resources team for further claims. Just because the person is working for the organization it doesn’t mean that the employee is applicable to take leave. It is granted for someone who works 156 days before applying for the leave. Here are some samples of medical leave. In an organization or in a company each and every leave of the employee will be considered and calculated under FMLA act. This gives a proper guideline about the leaves. Before writing one should be aware of the FMLA policies and rules of the company. After it is done then this letter can be passed to the human resource team to verify and approve. Here is a sample letter that describes the way to write a medical letter. With due to respect, I have written this letter to inform you that I may not able to come to office today as I had been unwell due to severe stomach ache and nausea for the past three days and I managed to visit my personal doctor the previous day who diagnosed me with low blood pressure and with acute gastritis. I have been prescribed by the doctor to take medication which will last atleast for seven days. While I am feeling better, I think it will be in a couple of days, but I will not be productive the present day. I hope that I will be alright to make it to work tomorrow but will keep you posted. Mr/Ms (Colleague) has offered to take up my work and to handle my clients for the day. If you want to transfer any of my projects to other employees please don’t hesitate. I have left my office email active; I hope this will help me to reply to my clients as much as possible from home. In case I am unable to report to the office tomorrow then I will let you know as early as possible so that you can make some temporary arrangements to handle the workload. Thank you for your constant support and understanding in this regard. Thus, all the organizations leave policies are entitled under Employment Act for which the eligibility will be the employee has to be worked with the employer at least for 3 months. The medical leave has to be approved by the doctor before the approval of the company. The number of days that are portrayed has to be mentioned in prior so that the employer can arrange someone else temporarily.